HALL, Katie Beatrice, a Representative from Indiana; born Katie Beatrice Green in Mound Bayou, Bolivar County, Miss., April 3, 1938; attended public schools of Mound Bayou, Miss. 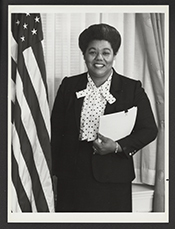 ; B.S., Mississippi Valley State University, Itta Bena, Miss., 1960; M.S., Indiana University, Bloomington, Ind., 1968; teacher; member of the Indiana house of representatives, 1974-1976; member of the Indiana state senate, 1976-1982; delegate, Democratic Mini Convention, Memphis, Tenn., 1978; chair, Indiana State Democratic convention, 1980; elected simultaneously as a Democrat on the Ninety-seventh Congress and to the Ninety-eighth Congress by special election to fill the vacancy caused by the death of United States Representative Adam Benjamin (November 2, 1982-January 3, 1985); unsuccessful candidate for renomination to the Ninety-ninth Congress in 1984; vice chair, Gary, Ind., Housing Board Commissioners; city clerk, Gary, Ind., 1985-1993; unsuccessful candidate for nomination to the One Hundred Second Congress in 1990; died on February 20, 2012, in Gary, Ind. Katie Beatrice Hall in Black Americans in Congress, 1870-2007. Prepared under the direction of the Committee on House Administration by the Office of History & Preservation, U. S. House of Representatives. Washington: Government Printing Office, 2008.